BadLand Games, the publisher of Metroidvania Axiom Verge, has announced that updated version Axiom Verge: Multiverse Edition, in addition to the Wii U, PS4 and PS Vita release, will be coming to Nintendo Switch. Multiverse Edition comes with a number of extras, with an art book, a poster, a documentary and, for the Switch version, a soundtrack CD. We reviewed the original version of the game, back when it released on PS4, PS Vita and PC back in 2015. You can find that here. Additionally, you can find the full details on Multiverse Edition, as well as the Switch announcement trailer, in the press release below. 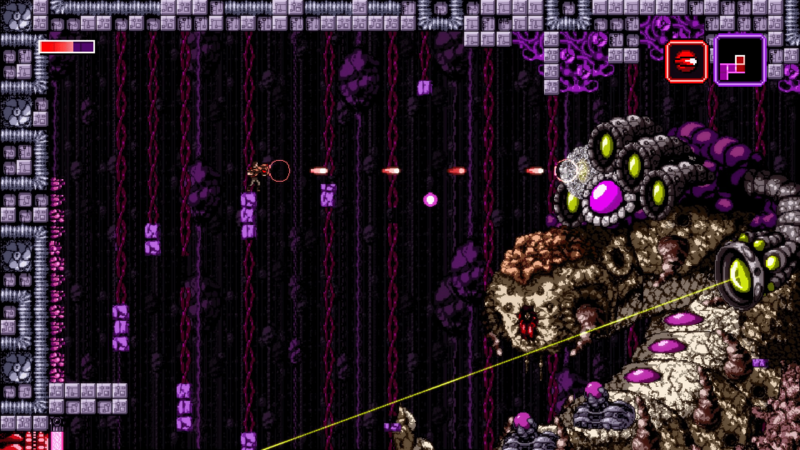 Axiom Verge: Multiverse Edition to also include making-of documentary by 2 Player Productions. Due August 2017. MADRID – June 08, 2017 – Retro gaming goes on the move as BadLand Games and Thomas Happ Games are excited to announce that they will be bringing the critically acclaimed Axiom Verge: Multiverse Edition to the Nintendo Switch™ alongside the Wii U™, PlayStation®4 and PlayStation®Vita. Watch the brand-new announcement trailer below. The Axiom Verge: Multiverse Edition will include a plethora of creative and nostalgic in-box content that will please any die hard fan or newcomer to the award-winning Metroidvania title. This includes a specially commissioned and exclusive 2 Player Productions documentary about Thomas Happ and the making of Axiom Verge. The Multiverse Edition will also feature a copy of the game, a deluxe booklet with developer commentary and art, along with a double-sided poster, plus if you pre-order before release you will receive the atmospheric CD soundtrack as well*. 2 Player Productions, known for Minecraft: The Story of Mojang, Double Fine Adventure!, and the Amnesia Fortnight documentaries, spent quality time with Thomas Happ to create a singular and emotive behind-the-scenes account for fans. This documentary addresses topics such as the development process of the 5-year solo production, the games that inspired Axiom Verge, and the challenges of balancing his game development career and the need to care for his son with special needs. Soundtrack CD. (Available only on the Nintendo Switch). Axiom Verge: Multiverse Edition will be available on PlayStation 4, PlayStation Vita, Wii U and Nintendo Switch, in August 2017. The Soundtrack CD will be offered as a pre-order incentive for all editions (the Multiverse Edition on the Nintendo Switch will also include it in the package). Pre-orders will be available shortly at retailers and e-tailers worldwide. Thomas Happ has worked on many different AAA titles for both PC and console – such as Grey Goo, Tiger Woods, and NFL Street, to name a few. He began working on Axiom Verge as a part-time hobby in March 2010 and released it for PS4 in March 2015. Working alone, Happ is responsible for all art, code, music, and game design. To learn more about Thomas Happ Games and Axiom Verge, please visit http://www.axiomverge.com. 2 Player Productions is a video production company based in San Francisco, California. It was founded in 2005 by Paul Owens, Paul Levering, and Asif Siddiky. Over the last decade, the trio has carved out a niche for producing long-form content about game development and the creative forces behind them. They have previously released making-of documentaries for Uncharted 3, Minecraft, Broken Age, Massive Chalice, and are currently in production on a series about Psychonauts 2 by Double Fine Productions.